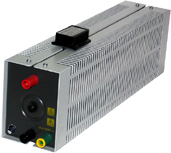 LV power supply specially designed to carry out practical works on any power electronics bridge (1-/3-phase rectifiers, choppers, 1-/3-phase inverter). It is plugged on mains (1-phv 220 V, 50 Hz). Cube-Elec 300 is compact and modular, it allows to implement a complete chain of automatic control.